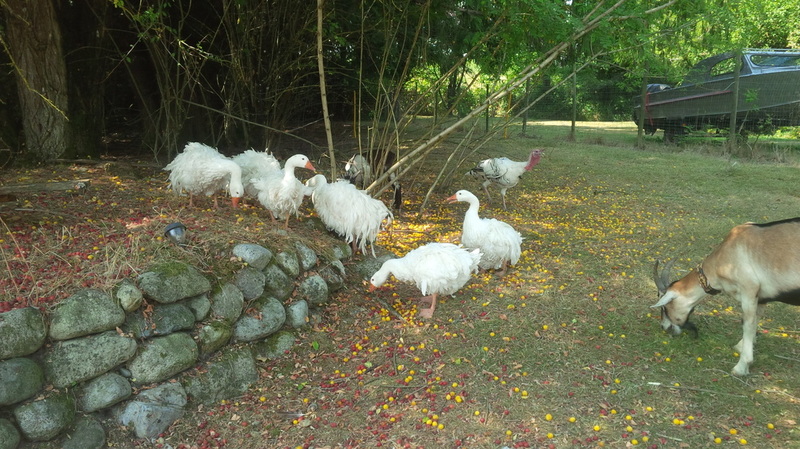 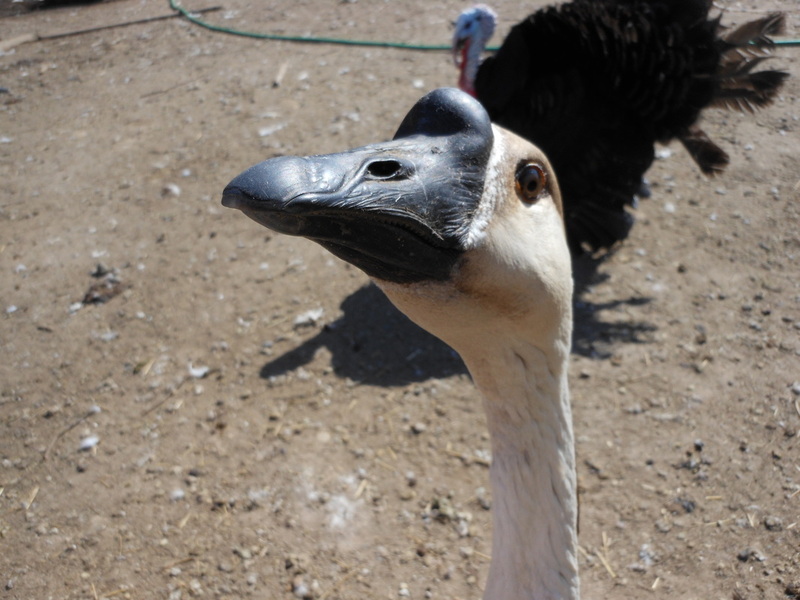 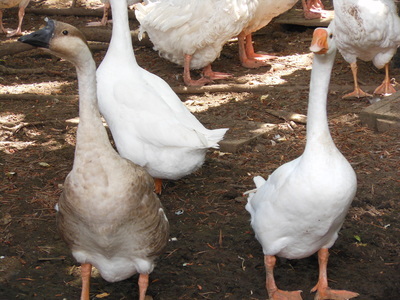 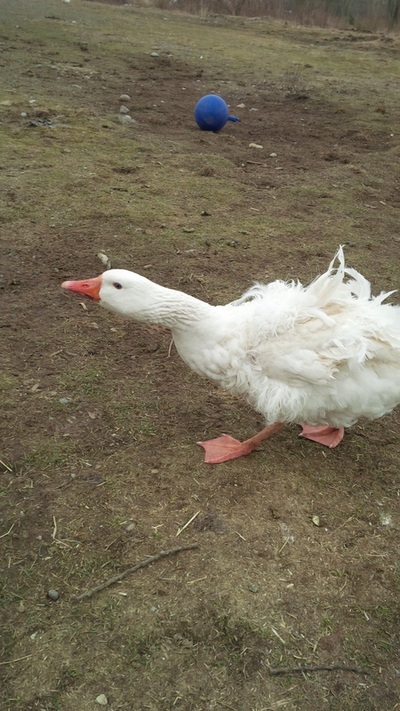 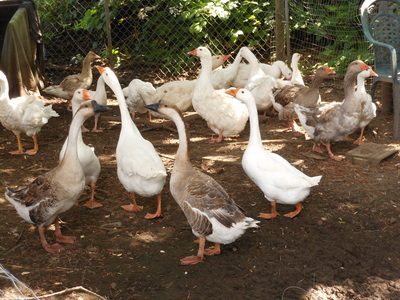 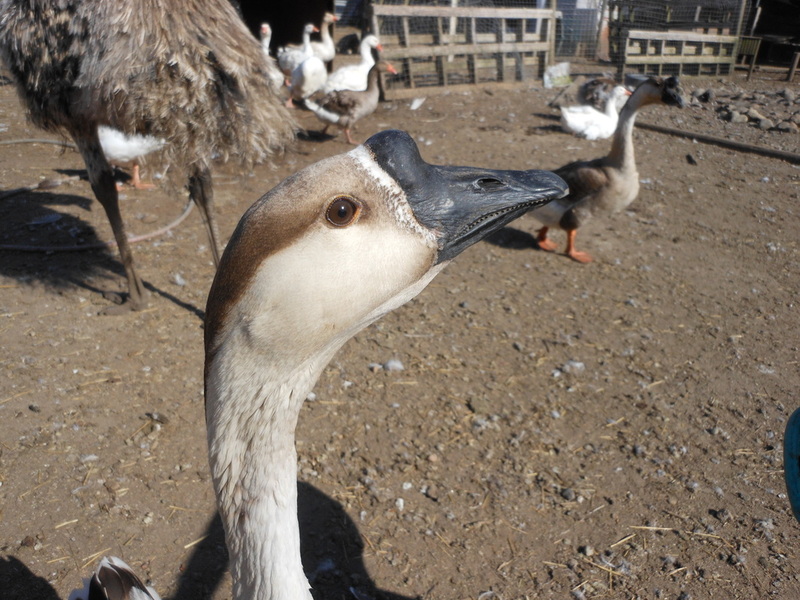 Sebastopol geese are our favourite geese here at Ekcentric Emu Acres and the main focus of our breeding efforts. We consider ourselves lucky to have bloodlines from around BC and across Canada. 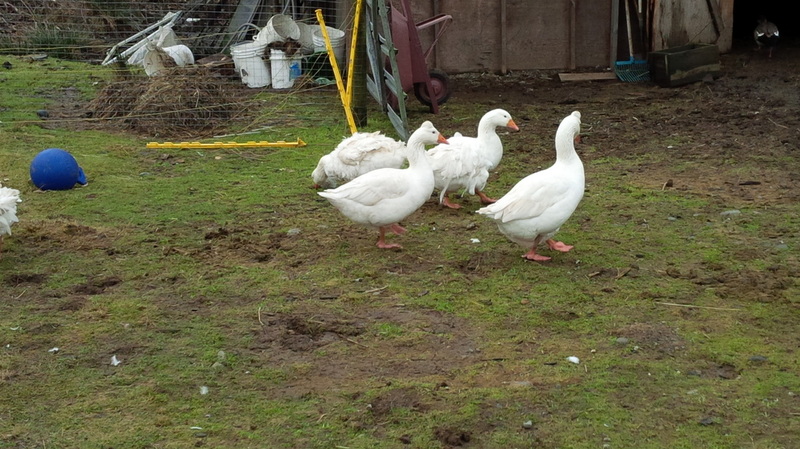 We hope to be adding new blood next year to the five existing bloodlines already here. 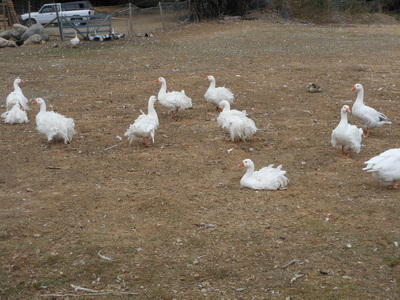 We have Sebbies in white, coloured solids and saddlbacks. 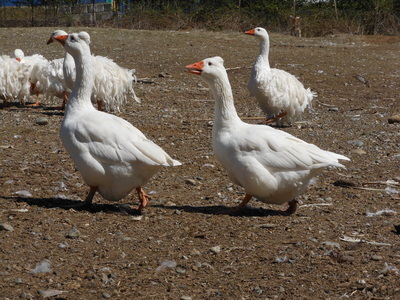 These delightful geese look at once elegant and goofy. 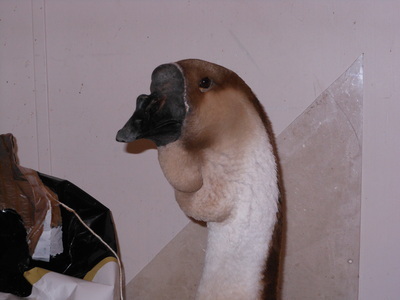 The Sebbies on the whole are less aggressive than Embdens and smaller, although all their poofiness makes them look a bit bigger. Sebastopols come in a curly and smooth breasted form. The curl Sebbie has curled feathers from the chest, back, belly thigh shields and tail, with the longer feathers growing from the scapula and back. The smooth breasted Sebbie has a smooth feathered breast, no curls on the chest, belly, and thigh shields with the longer feathers mainly coming from the scapula and back. 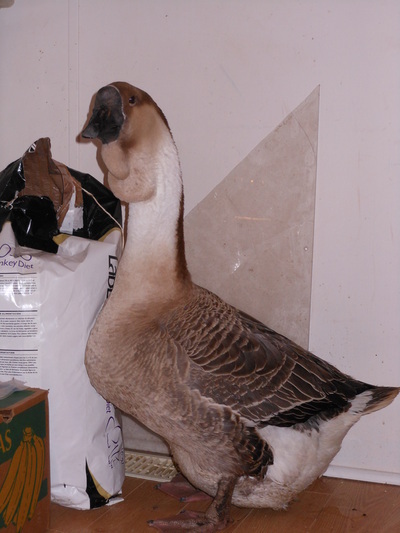 Although the smooth breasted does not qualify for show, being an non-APA recognized variety, serious breeders use the smooth breasted Sebbie to breed to the curly to reduce and/or avoid Twisted Wing Tip (TWT) which is common in many Sebastopols. 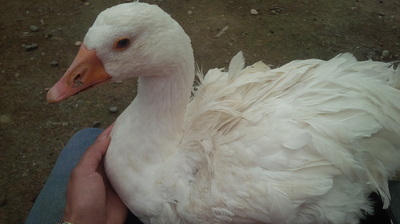 Although it does not harm the bird in any way, esthetically it not pleasing. 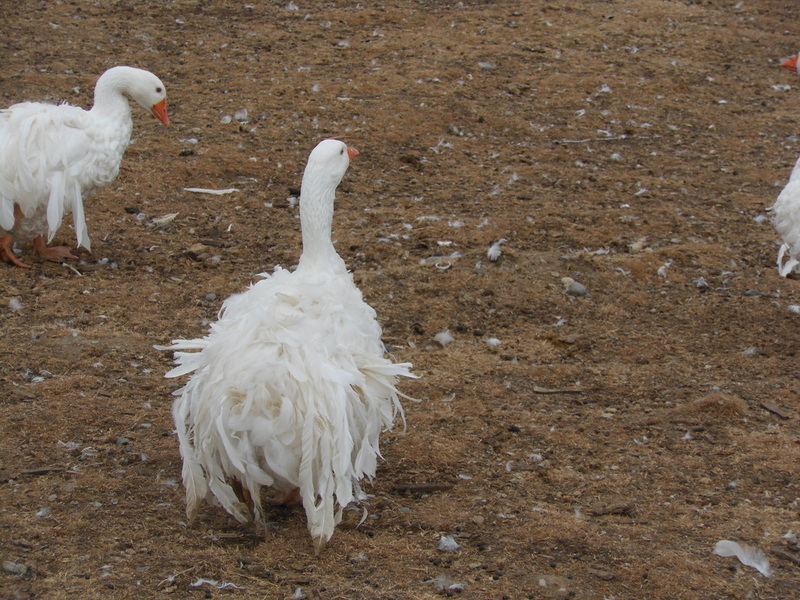 Smooth breasted x Smooth Breasted Sebastopols can produce all over smooth Sebbies, despite being "purebred" do not look like Sebastopols! 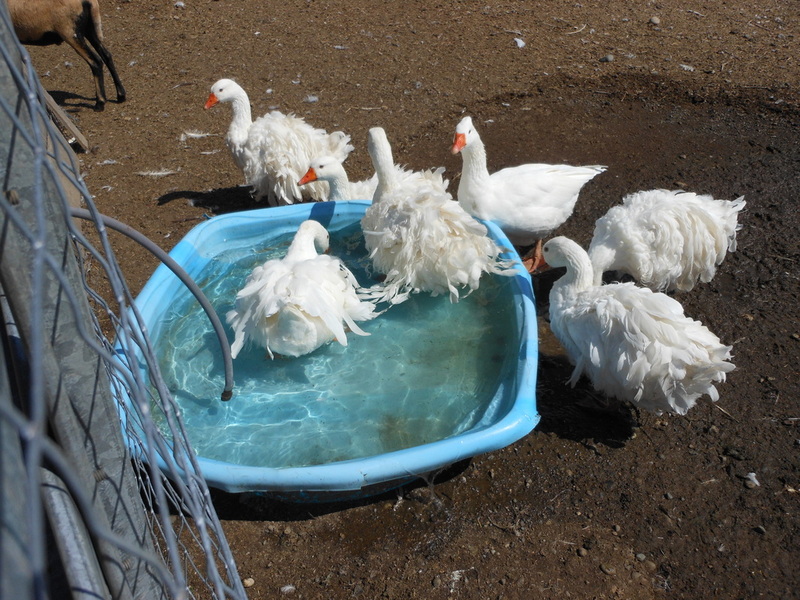 For this reason we do not sell day old or unfeathered Sebastopols. 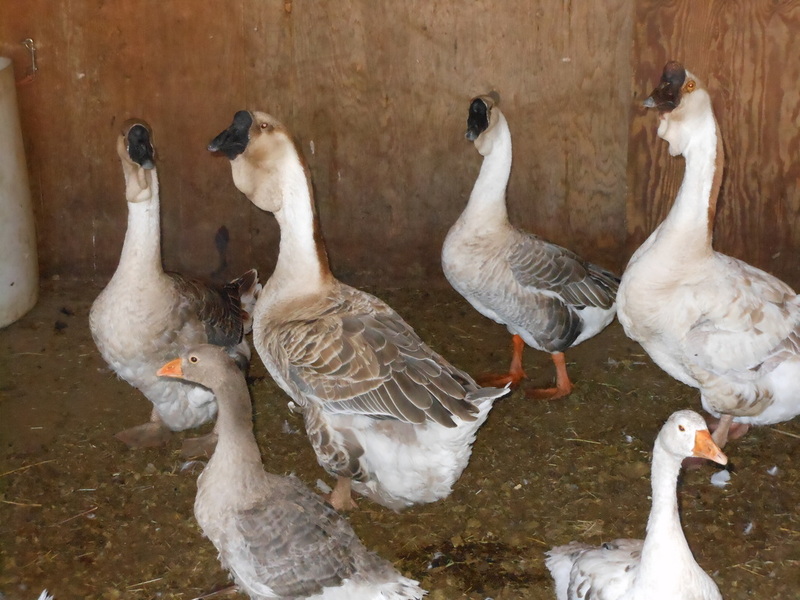 For our breeding program we must see how the wing tips and feathering have developed in our goslings to pick our best for next year's breeding. 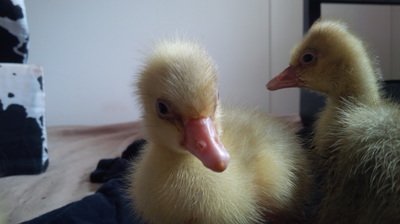 Thus Sebbies will be sold in the fall as young adults. 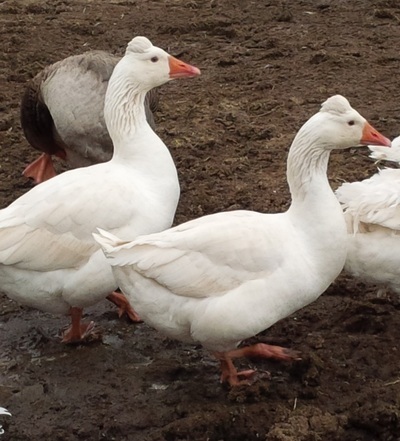 We absolutely love these geese! 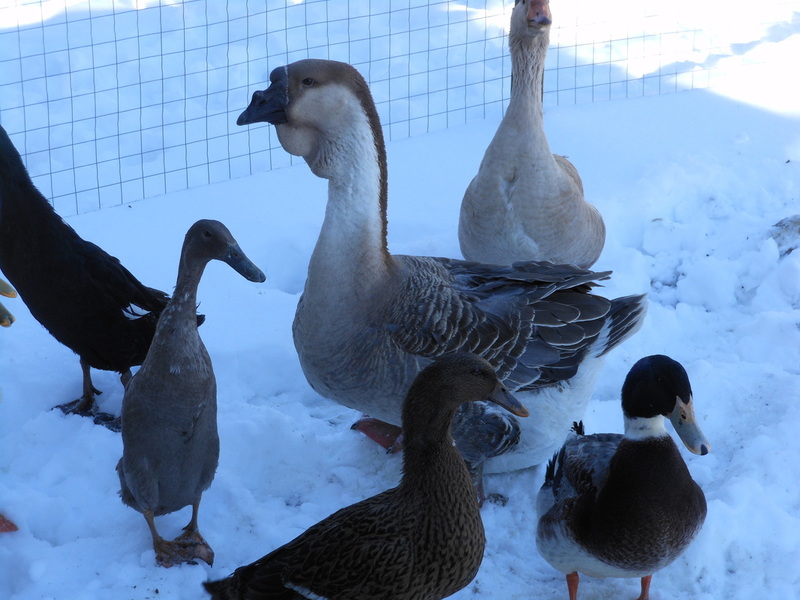 Tufted geese are a small light goose that are fairly uncommon in Canada. 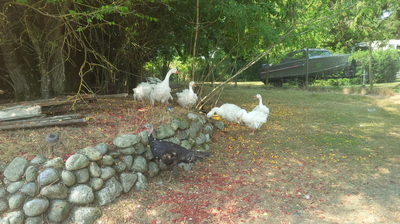 They are smaller than Embdens and are not aggressive at all. 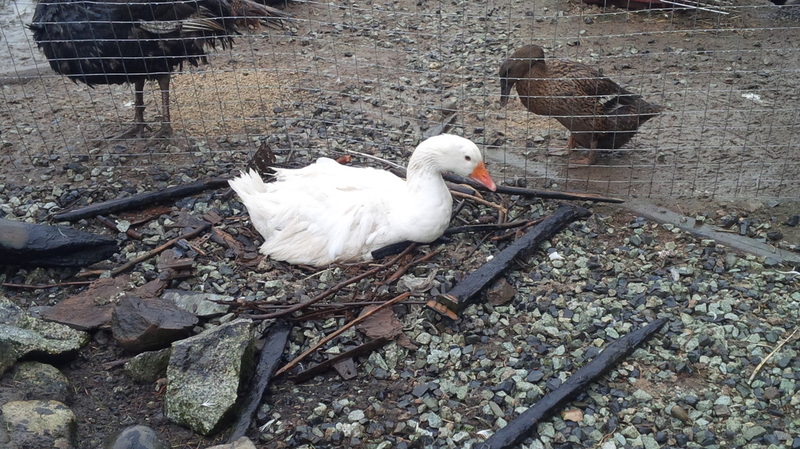 They lay a good amount of eggs per season and are good little nest builders and setters. 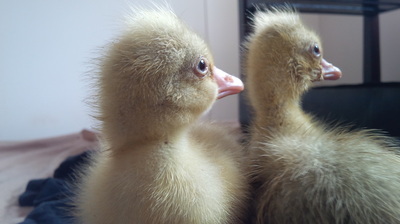 They have the cutest tuft on top of their head that ranges in size from a pom pom to a little "cowlick". 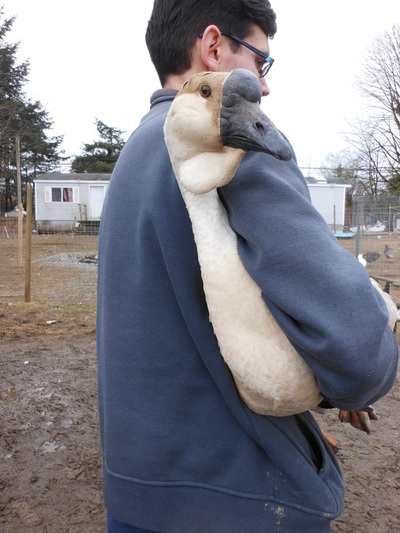 We enjoy our tufteds as they easy to handle goose that let us pick them up without little fuss and biting. Come nesting time though they do like to hiss and protect the nest. 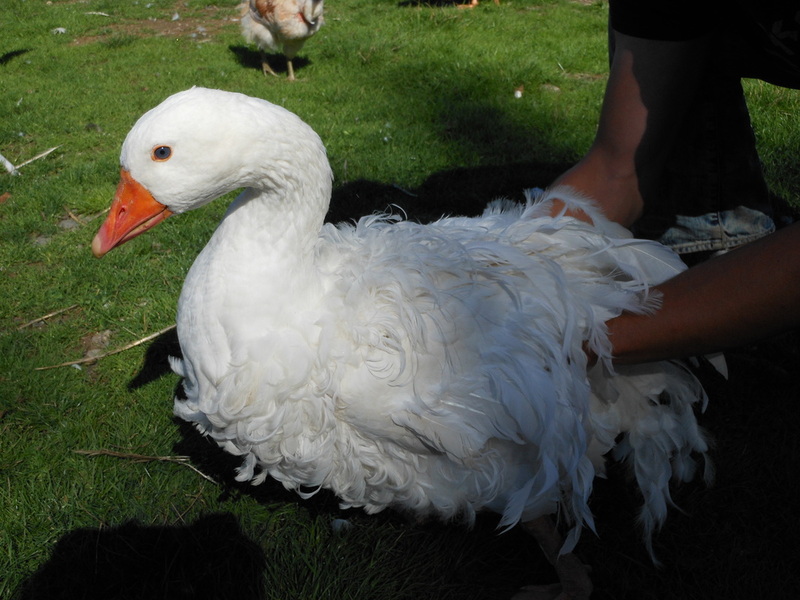 Update: We no longer keep Roman Tufted Geese, but do have Tufted Buff. We have Giant Dewlap African geese (aka Super African). 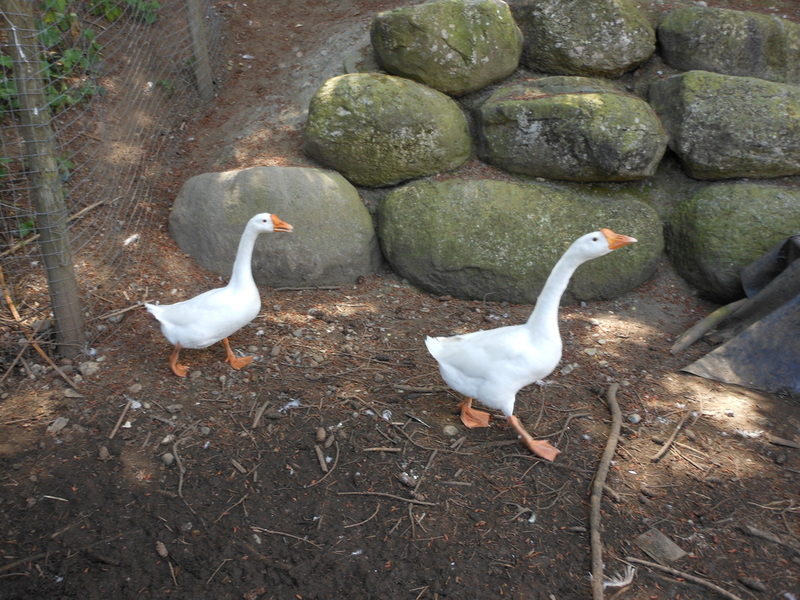 These are LARGE and TALL geese with big paunches and nice big floppy dewlaps. Our stock are from Dave Holderread. We have African geese in Brown and Buff. 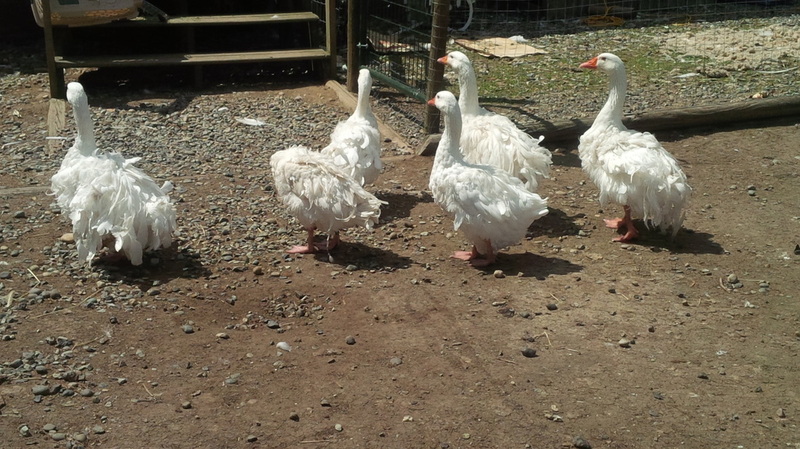 These big are extremely comical with their big waddling gate. 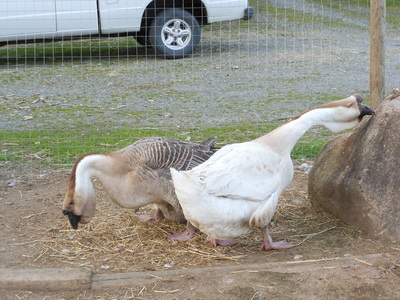 They make EVERYTHING their business and one particular pair are fantastic baby sitters that steal everyone's babies. Their personalities are as big as them and their looks are both regal and goofy. 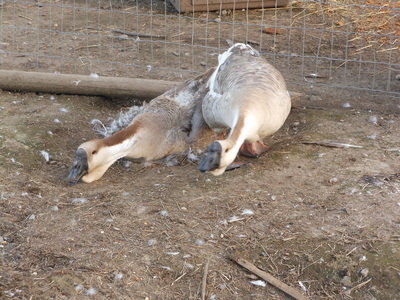 Due to their large size mating is difficult for them on dry land and a water feature seems to be required for good fertility. Update: We sadly lost our Buff gander over winter. 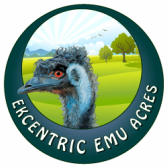 It seems an emu found him offensive. 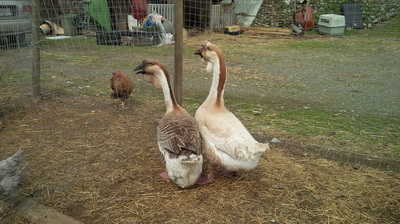 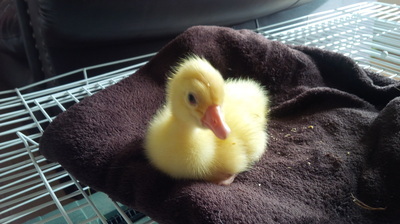 :( We have a backup brown gander however. 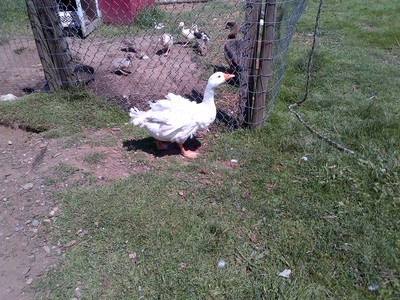 We have added Chinese geese to our flock. These are hatchery quality so are larger than the standard calls for, but still quite attractive with their beautiful buff and brown tones in the case of the Brown Chinese and pure white in the White Chinese. 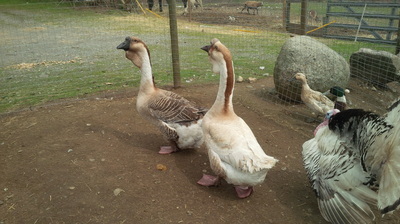 Chinese have a loud piercing honk as well as large knob at the top of their bill like African geese. 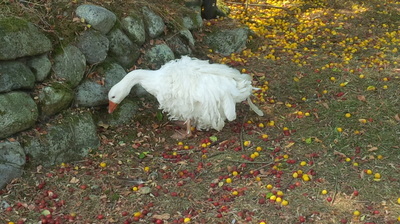 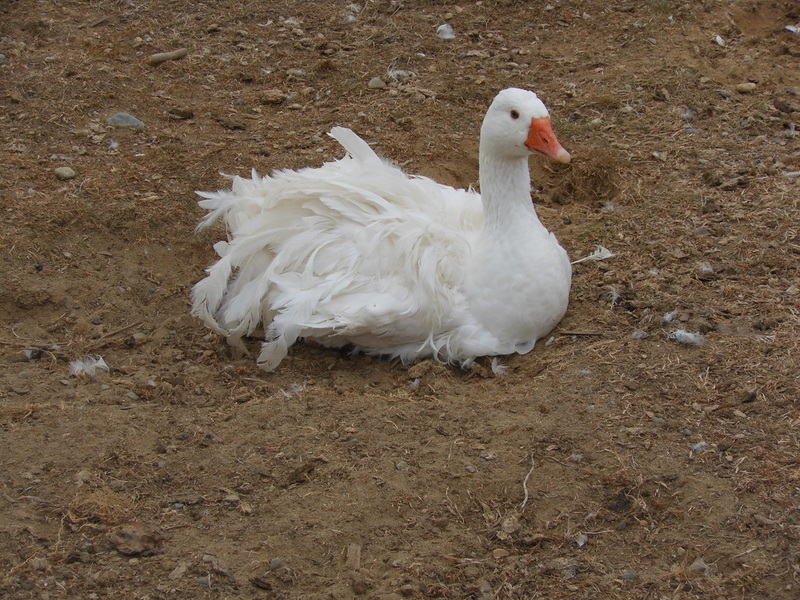 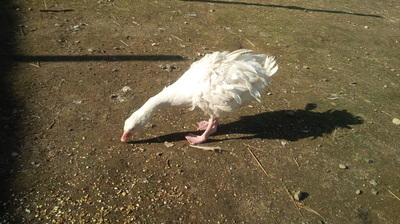 They are light breed goose with the white variety laying the most eggs of all the goose breeds. 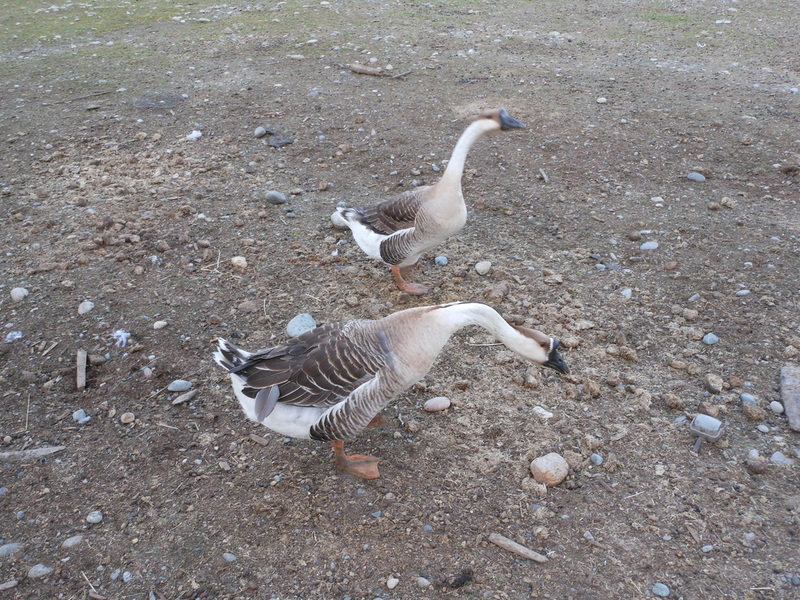 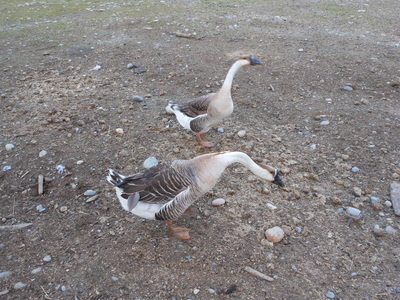 They are great alarm geese with honking and noise making whenever activity occurs on the farm. 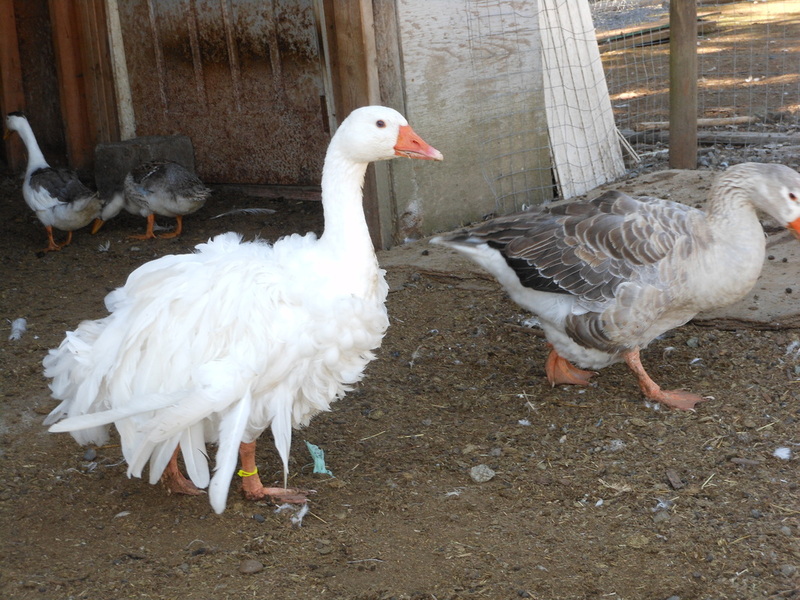 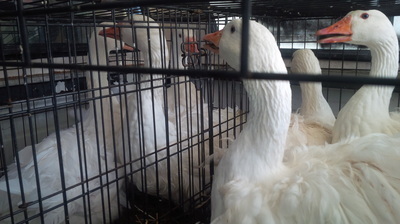 Update: We are keeping only white Chinese geese at this time.